We’d love your help. Let us know what’s wrong with this preview of Rainbows Bring Riches by Stacy Eaton. Paige Brogan has had a crush on Dabby for a long time, and this auction is exactly what she’s been waiting for to finally Dabby Finnegan got roped into being auctioned off for the annual Valentine’s Party, and nothing could have prepared him to face the vibrant and determined Paige Brogan. From the moment she jumps into his arms to collect her prize, his life will change. Welcome to the fourth book in the Celebration Township Series, Rainbows Bring Riches. This series consists of thirteen novel and novellas that take place over the course of a year, beginning with Christmas. During that year, twelve more stories will unfold in the Township of Celebration, Pennsylvania, and each release will coincide with an upcoming holiday. Tangled in Tinsel was the first book in the series and was released in October of 2015. While these books constitute a series, they can also be standalone stories. To ask other readers questions about Rainbows Bring Riches, please sign up. Holy Irishman on a freaking bull… Wow, what a book. Let me start by saying I love the Celebration Township Series. Stacy Eaton has written some amazing stories for the people of this quaint little town. But Rainbows Bring Riches has TOPPED THEM ALL. I mean every emotion came barreling to the surface with this one. Especially laughter, my God, can Dabby and Paige make me bust a gut. Paige and her spit fire attitude are just perfect. I mean she's a flash of green and a whole heck of a package to h Holy Irishman on a freaking bull… Wow, what a book. Let me start by saying I love the Celebration Township Series. Stacy Eaton has written some amazing stories for the people of this quaint little town. But Rainbows Bring Riches has TOPPED THEM ALL. I mean every emotion came barreling to the surface with this one. Especially laughter, my God, can Dabby and Paige make me bust a gut. Paige and her spit fire attitude are just perfect. I mean she's a flash of green and a whole heck of a package to handle but she's not too much, she's complete perfect. And Dabby what a nut to crack, but all the right ones are. This book was amazing and all the little additives made it so much more. You think it's just going to be short and sweet but there was so, so, so much MORE. As characters go, these two maybe be two of my favorites from Stacy Eaton yet!! This is book 4 in the Celebration series . Dabby is volunteered to be in the annual Valentines auction .. note is volunteered not his doing ..
Fun and games begin ..poor Dabby doesn't know what hits him ..
Rainbows Bring Riches is the fourth book in The Celebration Series written by author Stacy Eaton. This is a delightful series. Each book becomes my favorite. Dabney and Paige's story is funny and sweet. It's a treat to look forward to reading a new story every month. My favourite pairing of the series so far. Not really much drama just two finding love. I loved Paige, how quirky she was and how fast she spoke. Heck at some points it felt like it read that way. Then there’s Dabney, gentle grumpy giant. This one was adorable. Charming! Paige buys a date with Dabby at the Valentine's Day auction. She just wants to get to know him better as she has had a crush on him since the moment she saw him. Dabby is a bit stuck in his ways. Will he let this vivacious lady into his life? Paige is such a spunky funny character and it's great when she goes after Dabby, who interested me from the first book. This book is funny and emotional so be prepared. Another fabulous read in the Celebration Series. Stacy Eaton has created a perfect little town named Celebration that I know I would love to live in. Since I can not i simply have to read every book she writes based in this town. In this book we get to meet and enjoy Paige and Dabney. Paige wins a date with Dabney at the bachelor auction. Now Dabney or Dabby as every0ne else called him owned the local tavern. Paige was the local medical examiner. But no one would know it as Dabby says as she is so full of sunshine and light. You have to read th Stacy Eaton has created a perfect little town named Celebration that I know I would love to live in. Since I can not i simply have to read every book she writes based in this town. In this book we get to meet and enjoy Paige and Dabney. I voluntary read this Advanced Reader Copy of this book. It was a good book, but sad Dabby lived his entire life in Celebration. They have a Valentine auction and he got roped into it. Paige had seen him before and she bid for him and won. I voluntary read this Advanced Reader Copy . It was good but sad. Danby lived in Celebration all his life and owned the travern his Father owned. He got roped in the Valentine auction. I really enjoyed this book. Once I started reading it I found it so hard to put down. Dabney owns a bar and his friends talk him every year into being in the Bachelors Auction that is held for charity. Every year the same woman buys him and he gives her and her man a free dinner at his tavern. Not so this year. Paige pays a thousand dollars for him and wants to divide the date into two dates. The first one she wants to come to his tavern and work and the second one she wants him to follow her aro I really enjoyed this book. Once I started reading it I found it so hard to put down. The first one she wants to come to his tavern and work and the second one she wants him to follow her around the hospital and work with her for the day. Book #4 in the series. Come back to celebration township and meet Dabby, a tavern owner, and Paige Brogan, a feisty redhead. What a fun couple. What a fun story!. This story had me laughing. Paige is a fast talking, life loving woman! while this can be read alone this is so much better as part of the celebration series - 13 stories that span a year and introduce you to wonderful, real, warm, fun loving, amazing characters. This is a town I want to visit. Stacy's books pull you in and allow you, Book #4 in the series. Come back to celebration township and meet Dabby, a tavern owner, and Paige Brogan, a feisty redhead. What a fun couple. What a fun story!. This story had me laughing. Paige is a fast talking, life loving woman! Dabby Finnegan got roped into being auctioned off for the annual Valentine’s Party, and nothing could have prepared him to face the vibrant and determined Paige Brogan. From the moment she jumps into his arms to collect her prize, his life will change. Paige Brogan has had a crush on Dabby for a long time, and this auction is exactly what she’s been waiting for to finally catch his eye. When Paige wins a date with Dabby, the only thing she wants to do is spend the day with him working at his tav Dabby Finnegan got roped into being auctioned off for the annual Valentine’s Party, and nothing could have prepared him to face the vibrant and determined Paige Brogan. From the moment she jumps into his arms to collect her prize, his life will change. Paige Brogan has had a crush on Dabby for a long time, and this auction is exactly what she’s been waiting for to finally catch his eye. When Paige wins a date with Dabby, the only thing she wants to do is spend the day with him working at his tavern. Dabby gave up hopes of a wife and family years ago and has only his bar to care for. His feelings for Paige surprise him and he must confront them or lose her. Paige has been through too much to give up what she wants, but she can only be pushed away so many times before even she knows it is a lost cause. 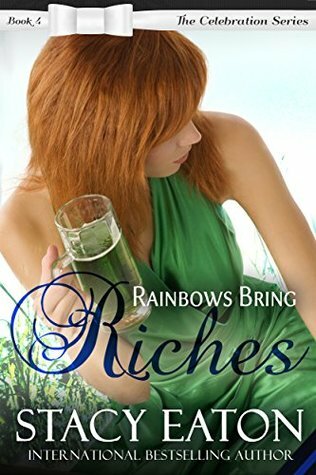 I'm really loving everything about the Celebration Series and book 4, Rainbows Bring Riches lived up to my expectations. I love so much about Paige. Her personality is so infectious and Dabney just doesn't know what to make of her. She's so sure that they will be a great couple. They seem so opposite but they really aren't. I love how Dabney slowly comes to realize how much he really likes Paige. This is such a good story. Loved the book, 4th in the Celebration series. Dabby didn't stand a chance once Paige set her sights on him. The two just fit together and are the balm to each other's sorrows. Need a book to read when curled up under a blanket by the fire, then this is the one. Another great read by Stacy Eaton. What a delightful and fun novella. This is a truly wonderful series that is lighthearted, enjoyable, and definitely worth the read. Simple joys and pleasures seem to bring couples close together in the town of Celebration. Despite differences in character or personality, individuals seem to find their match and learn to treasure what they have gained in their life. Friendships, relationships, family and everything in between fit "Rainbows Bring Riches"
Friendships, relationships, family and everything in between fit into each of these novellas. It makes them an engaging and richer read. Ones not to be missed. This has been my favorite book of the Celebration Series so far. I loved Dabby and Paige. But especially, I enjoyed how Paige could find such joy in little things like working in a pub despite the tragedy in her past and the morbidity that surrounds her job. She really complimented the stubborn Irishman in Dabby. I thoroughly enjoyed this book and can't wait for the next one! I received an advanced reader copy of this book and voluntarily provided this honest review. This is my favorite in the series so far. Dabby is a laid back tavern owner and Paige is a outgoing medical examiner. An auction for bachelors and the two put together makes for a fun time. Paige hits Dabby like a hurricane and Dabby is like a fish out of water. I voluntarily reviewed this ARC book. 5 stars! Oh the Celebration Series keeps getting better and better!! Dabby and Paige's story was beautiful!! It made laugh and toll my eyes. It made cry and want to hug the characters. Im so very happy this series is planned to be a long one. Because the people of Celebration Township are crawling right into my heart! This was an AMAZING story! Filled with honest emotion and two characters you will fall in love with as they fall in love withe ach other. I received an Advance Reader Copy and am voluntarily leaving a review. another great read. this is a page turner you can't put down. opposites attract. you can't fight love when it finds you. friendships develope and stick. Stacy resides in southeastern Pennsylvania with her husband, who works in law enforcement, and her teen daughter. Stacy Eaton is a USA Today Best Selling author and began her writing career in October of 2010. Stacy took an early retirement from law enforcement after over fifteen years of service in 2016, with her last three years in investigations and crime scene investigation to write full time. Stacy resides in southeastern Pennsylvania with her husband, who works in law enforcement, and her teen daughter. She also has a son who is currently serving in the United States Navy.